Construction of the roof and tower of Ohrstrom Library as seen from the scaffolding surrounding the chimney – taken in the fall of 1989. A new online exhibit is available on the Ohrstrom Library Digital Archives website: Ohrstrom Library Celebrates 25 Years. This exhibit features sixteen photographs from the St. Paul’s School Archives collection that document the planning, construction, and dedication of Ohrstrom Library twenty-five years ago this spring. On the 25th Anniversary of Ohrstrom Library, we are pleased to present this exhibit highlighting some of these events that were the result of years of careful planning and great thought by many who cared deeply for the role of the library at St. Paul’s School. Take a few moments to enjoy the photographs, descriptions and slide show of Ohrstrom Library, celebrating this milestone in the history of St. Paul’s School’s dedicated tradition of academic excellence. Access the online exhibit by clicking HERE. 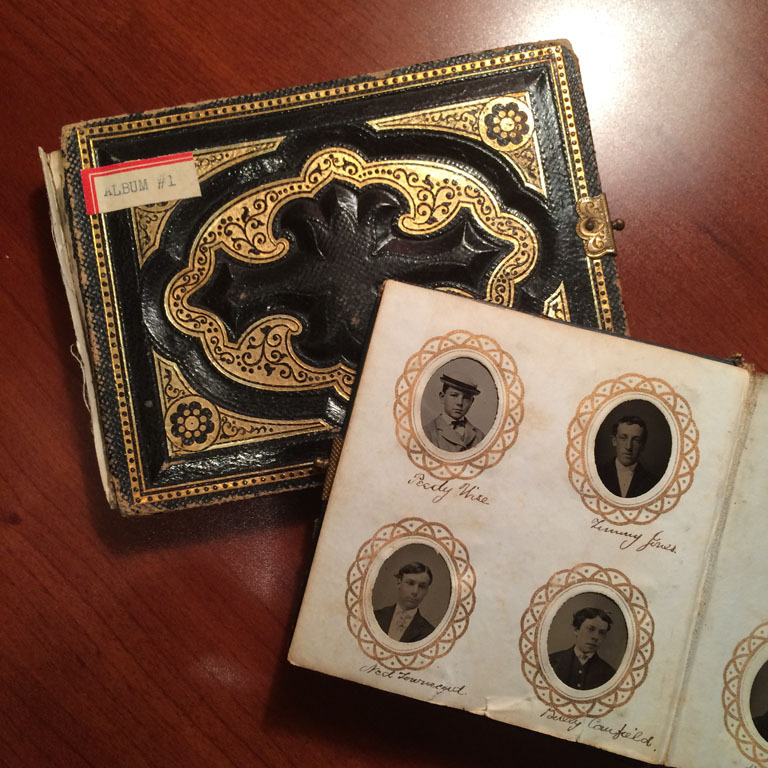 A new online exhibit is available on the Ohrstrom Library Digital Archives digital image website called Archival Gems: The Gem Tintype Albums of St. Paul’s School. This exhibit features fifteen images from the St. Paul’s School Archives collection taken from the two gem tintype photograph albums shown in the image above. Gem tintypes are tiny photographic images about the size of a postage stamp created using a specialized camera with multiple lenses. These albums date from the late 1860s and represent some of the earliest photographs of students in the archives collection. Learn more about this interesting early photographic process through these detailed student portraits by clicking HERE. Welcome to the 55th Session of ASP! St. Paul’s School founded the Advanced Studies Program in 1958 to provide talented New Hampshire public and parochial high school juniors with challenging educational opportunities, and use of the Ohrstrom Library is integral to this enriching experience. 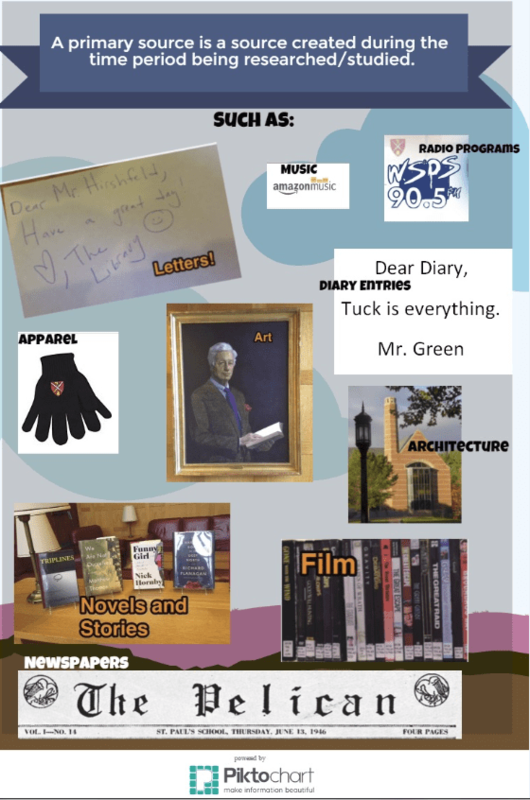 The staff of Ohrstrom Library welcomes ASP faculty and students and hope that you enjoy and take advantage of its collections and services this summer. The ASP went co-ed in 1961 (10 years before SPS). The ice-cream machine in the Upper is provided by the ASP. In its early years, the ASP was primarily focused on math and science, offering such courses as: biology, calculus, chemistry and physics. The evening door count at the library is at its highest during the ASP. Man and Media, a pre-cursor to today’s Mass Media course, was taught by author, and former SPS and ASP faculty member, Richard Lederer. College Counseling services were added to the ASP in 1979. In a green effort, the school dining hall went trayless in 2006 – beginning with that year’s ASP class. The former Rector, William R. Matthews, Jr., SPS ’61, is also a former ASP faculty member. Despite the flood of May 2006, the ASP still ran, but without access to Hargate or Ohrstrom Library. There are currently over 10,000 ASP alumni! What else was going on in 1958? The American singing group, The Jamies, the doo-wop duo of Tom and Serena Jameson, released the single “Summertime, Summertime” for Epic Records, which reached #26 on the US Billboard Hot 100. In Celebration of Cricket: From School Sport to Celebrated Tradition is available in ePub format for download and viewing on your iPad, iPhone, and iPod Touch devices with iBooks installed. It has been designed specifically for viewing in iBooks, but can also be read with a more basic layout on any eBook reader that supports the ePub file format. You can download this new eBook by clicking HERE. This eBook presentation is a companion to the archives online exhibit of the same name viewable HERE. It contains photographs from the St. Paul’s School archives collection and includes descriptions and information related to the history of the game of cricket at SPS and the enduring popularity of the Cricket Holiday tradition. Visit the Ohrstrom Library Digital Archives eBook page to see other available titles by clicking HERE.